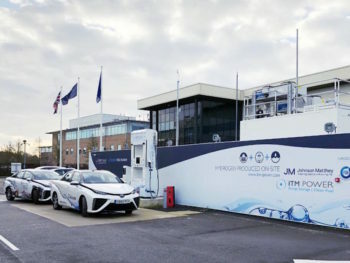 The site – which marks the firm’s seventh public access station – is located at the offices for fuel cell component manufacturing firm Johnson Matthey and is open for public and private fleets operating fuel cell electric vehicles. The station uses electricity via a renewable energy contract and water to generate hydrogen on-site with no need for deliveries. ITM added that it’s collaborating with local stakeholders to develop a significant FCEV fleet around the new station. The site has been deployed as part of the pan-European H2ME2 project, which was funded by the European Fuel Cell and Hydrogen Joint Undertaking (FCHJU) and the Office of Low Emission Vehicles (OLEV). The programme will also fund a further ITM Power station, which will open at Gatwick Airport before the end of this year. Although just three FCEV models are currently available worldwide – the Toyota Mirai, Hyundai Nexo and Honda Clarity – industry-watchers believe at least 20 models – from up to 10 different manufacturers – could join the FCEV marketplace in the next five years. The new site joins ITM’s existing public access sites on Cobham on the M25, Beaconsfield on the M40, Rainham in Kent on the A14, Teddington in London, Rotherham on the M1 and Kirkwall in Orkney. Swindon is also home to one of the Hydrogen Hub schemes, being run in partnership with Arval.